Okay, so then the word "dummy" was uncalled for. Got it. *admin hat* Please don't throw in epithets, however true or even funny you may believe them to be. "Dummy" is not an epithet. Considering the language you use in the chatroom, you shouldn't get upset at "dummy". The chatroom is a different animal than the forum. We try to avoid name-calling in the forum. And even in the chatroom, I'd say we try to limit it to what we all feel comfortable with. We want to be inclusive. Dummy is a noun, no? As in a ventriloquest's dummy (like Achmed the Dead Terrorist)? I should have said "I-840, person making a false statement authoritatively". But then he'd be Kettle. That I-369 is too long for a spur. Should be I-45 extension and have it end at I-49 north of Texarkana. But again, I forgot the routes like I-476 in PA and I-395 in CT/MA. oh well. 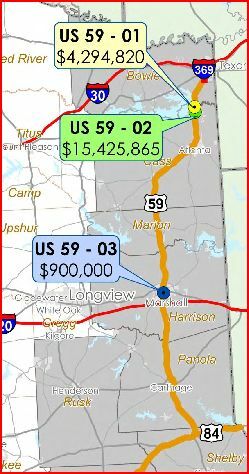 TxDOT has posted The I-69 System (I-369) Harrison County/Marshall Route Study page that will essentially study whether to upgrade the existing US 59 through Marshall or to build a relief route, with the study anticipated to be completed in "late fall 2014"
"I-69 and I-369 will follow the current US 59 footprint through Texas, but relief routes are needed around many of the towns US 59 passes through in order to prevent the loss or relocation of many homes and businesses in the towns," Judge Taylor said. 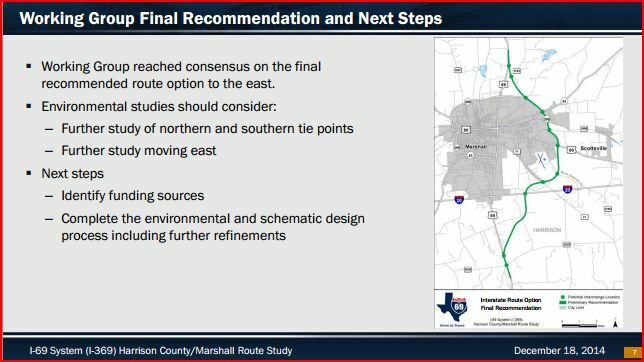 "The purpose of this study group is to determine the best route for the highway to pass through Harrison County and, particularly, around the city of Marshall." The group will be looking at the future transportation needs of the area and routes with the least amount of impact to citizens and businesses. They will also actively seek public input from local citizens, business owners and elected officials concerning possible routes. "Having ready access to good and efficient transportation systems are vital to business and industry anywhere. Being at a crossroads of two interstate highways through this area can bring lots of businesses and jobs to the area. If new routes are needed for these highways, then we need to know the best location for them and have a say so in where they are located," Judge Taylor said. Still doesn't make sense to overlap a route over another route just to terminate it at a third route while the second route continues. The less concurrencies, the better. 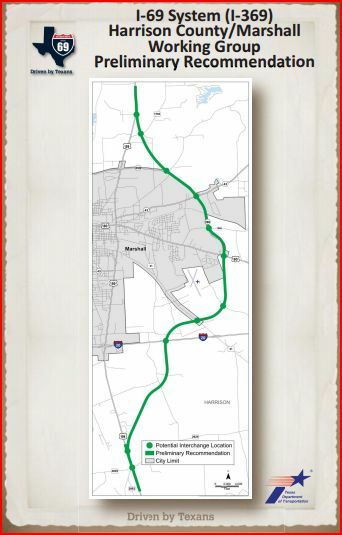 The I-369/I-69 System Harrison County-Marshall Study Group, comprised of 15 local citizens and elected officials, held its first meeting to begin a study on the possible future route of Interstate 369 through Harrison County. Taylor, who is also involved in the I-20 East Texas Corridor Study, said the timeline of the study will parallel with that of the I-20 study. “It dovetails together because you just can’t do one without the other, under the circumstances,” said Taylor. Why is there a new alignment needed for I-20? Looking at the fact sheet on the web site, the I-20 study is focused on getting local input for needed improvements in the corridor. Improvements could include new frontage roads, additional main lanes, safety improvements and median barriers. There is one mention of study of possible "Alternate routes", which could mean many things. 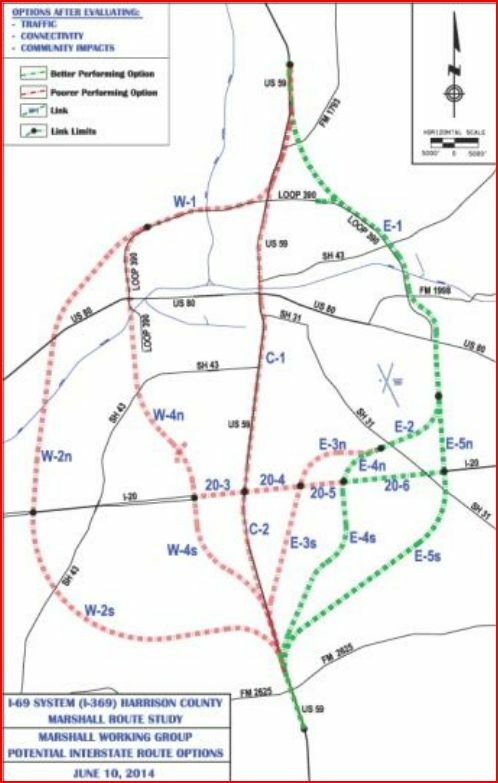 Reading the article at the link in the previous post by Grzd, I don't interpret anything in that article as suggesting a new alignment for I-20 is on the table. Obviously there would be an interchange between I-20 and I-369, which would likely necessitate improvements and new lanes on adjacent sections of I-20. In my view, I-20 will need six continuous main lanes for most or all of its full length through east Texas at some point in the future. Apparently, there'd be opposition to the west of Marshall because it's more built-up than to the east, but I may be wrong. As I recall (having driven it back in May), west of Marshall is more built up. Yeah, the loop on the west side isn't that suitable. Might as well build the brand new corridor to the east and be done with. You could also probably get away with very few frontage roads to the east, which should keep development to a minimum directly alongside the freeway. From south to north, the recommendation option deviates from existing U.S. Highway 59 north of Farm-to-Market Road 2625, crosses Interstate Highway 20 just east of the city wastewater treatment plant, passes south of the airport, uses the Loop 390 alignment to north of Marshall, and then connects back to U.S. 59 north of FM 1793. A pamphlet about the project noted that the working group requested the preliminary recommendation to be refined to include an interchange at North Buck Sherrod Road to provide better traffic circulation. It looks like the proposed new terrain North Buck Sherrod Road interchange would be slightly east of the southern end of the airport. That route includes the east half of Loop 390; the interchange at SH 43 is set up for easy dualling. Thomas said the interstate construction in Carthage should be smooth. The entire loop is four lanes except for the Southwest segment from U.S. 59 to Highway 315. Outgoing Panola County Judge David Anderson said the county would have to be aware of the oil industry going into 2015. “I think you are going to see the drop in oil and gas is probably going to affect us. It is probably going to affect the appraisal values,” he said. The county will also continue to work on road projects including continued work on I-69 and the loop around it. However, I think AASHTO does have the authority to determine the proper first number of the designation; in other words, should it be I-"3"69? Since the statute does not provide a specific spur designation, I think AASHTO has authority to require that it comply with the conventional spur numbering scheme and be designated as I-969 (or maybe I-769), and I think that there is a reasonable chance that they will issue a conditional approval that will require a change in the designation. What convention? There might be a pattern that some states use, but there doesn't look like a convention to me - or if there is, there's a lot of exceptions. I reckon it's more likely that AASHTO would raise the question of why not I-169 (as the lowest free number - with no conflicts with other states), than raise the question of why not I-969. “The next step after that is to work with TxDOT (Texas Department of Transportation) to design the portion that connects 550 with I-69 East to just east of the new overpass on Old Alice Road,” Sepulveda said. “That will be designated as Interstate-169 ..."
Wonder how long it will be before an I-569 is announced somewhere in Texas? That developing freeway spur of TX-44 off of I-69E in Robstown going toward Corpus Christi looks like a very obvious I-569 candidate. Going one better, if TX-44 was turned into I-569 then TX-358 could conceivably get turned into I-769. I wonder where I-969 could wind up in Texas. However, if FHWA does have a 3di progression policy, then why did it sign off on an I-369 designation for the Tenaha-to-Texarkana spur instead of requiring an I-969 (or perhaps I-769) designation for that spur? If anything, english si's observation that there are a lot of exceptions to this guidance appears to be directly on point. It doesn't say they should increase from south to north. It's also not clear if that's still followed, or if it was only used in the initial 1950s numbering.